Cyprus?! Ah, the island in the Mediterranean. Oh, it’s in Asia. That fits! Fits whom? Well, us! The “us” are we – radio amateurs – and the “fit” is the ideal location for the IARU Championship, from which to “harvest” European stations, and Cyprus is so much closer to the equator than Latvia. Yes, Cyprus. The island of ancient history, blessed by the sun, located in the waters of the Mediterranean, an island with a complicated history. It lies there as a beautiful and tempting woman, who entices everyone who comes near her. It is an island you fall in love with long after you have left it, and it still remains in your memory. It’s the home of the goddess Aphrodite. In Latvia, there lives this “old man,” who can constantly be heard in contests – Girts, YL2KL. Thanks to his stubborn persistence, this, almost lunatic, plan became reality – collect ham operators from Latvia for a trip to the IARU championship. Very forward, and some may say, quite a brash plan. But if there is a will, what else is there to do? It has to be admitted that there is a lack of resources in Latvia. Money, money, and again money are a projects’ major stumbling block. A big Thank You goes to the company “Latvijas Mobilais Telefons,” who helped out with airline tickets. The rest was “scratched together” by ourselves, and the “dream” was nearing reality. It’s not a big secret, this is the list of “dreamers”: Girts Budis, YL2KL; Juris Petersons, YL2GM; Valerijs (Larry) Sincovs, YL3CW; and Girts’ old “buddies” from previous H20A competitions – Igor Mihejevs, RZ3BW, and Igor Ustimenko, RA3CQ. Later Dimitri (Dima) Krjukovs, RA9CO, a fellow “dreamer”, who likes islands in the south (such as VP5, just to mention one), joined the group. As you can see, some of them were exposed to the southern sun for the first time, while others were more fortunate in this respect. That’s fine, at least not all will faint from heat stroke at the same time, and someone will be able to navigate a car in left-handed traffic. The first group – both Igors from Moscow, and Larry with Jack, went there a week ahead and were transporting both PA’s, reserve transceivers, some important “junk” and some antennas. The main thing was to find a new QTH. The previous location in Limassol Hotel was nice, but not well located. Mountains covered up the northern horizon. So, using some mysterious car rental rebate, a jeep without a roof, but a cargo area in the back, was obtained. All rental vehicles have a red license plate in front. It means, watch out, this vehicle may occasionally drive on the wrong side of the road. There is still considerable British influence in the country, most people speak acceptable English, and drive on the left side of the road. So, thinking about locating at higher elevations, we scoured all Trodos Mountains upper reaches around mount Olympus – 1950 meters high. Beautiful, no factories, only naturally wild southern mountain environment, and mountains and more mountains. All in shades of copper that lies there underground. Yes, the area is settled by people, but for a newcomer all looks like a child’s’ play, but if the truth were known, all established after heavy backbreaking work. We found a super location, an abandoned large and baronial-looking hotel that reminded one of a castle built in Middle Ages. But we couldn’t get access. Neither diplomatic or other means were able to gain entry, and besides, there was no electricity. If one lacks good contact with the local villagers, then it becomes very difficult to get something accomplished. A small hotel in the town of Pedoulas , located 1200 meters above sea level, becomes a most suitable alternative. The town is located on a northern slope, nicely configured, with a proud Greek Orthodox cathedral in the center of town, and with a big, illuminated cross at the top of the mountain. An old location, someone mentioned it already in 1474. There is a mountain spring, which probably was one of the reasons the area was settled, and today the water is bottled in large plastic bottles. The hotel is named ”Jacks Hotel”; flat-roofed, not many guests, an understanding proprietor, and friendly hotel employees. As it turned out later, the water there came also from the mountain spring. This meant a saving in water expense, and allowed us to put more Cypriot pounds to good use tasting “KEO” beer pints. It is pleasantly-tasting, with a distinctive bitter taste, particularly after swallowing the first sip. Hotel is not expensive, three meals a day, the northern side is open, we are fairly high, building has five floors on a slope – all as luck would have it. Antennas, antennas. Yes, many are needed, and they are indispensable. We mounted sloper dipoles for 160, 80 and 40 meters. Then, in a few minutes, we assembled a DX-77 vertical. The highest degree of “heroism” was displayed in accessing adjacent private, undeveloped and overgrown property. In short shorts and shoes of questionable usefulness, the mobility through brush and stinging thistles was considerably impaired. To us, who only knew how to call a pine tree by its proper name, everything was stinging feet, hands, and other parts of the body. We were told there were snakes, we didn’t see any, but we did see big lizards, about 30 cm long and very fast. Maybe a dangerous creature, but no one knows for sure. Be it as it may, the lizards we saw looked well fed, if one were to judge from their ground-scraping bellies. The last heroic deed of the foursome was the mounting of the two-element quad for 20-15-10 meters. That went painfully slow. The sun, heat, lack of places to tie down supports, heavy hardware – the whole ball of wax. After this operation, YL2KA suffered a scraped skull, and scratches between the sandal belts and on upper parts of his feet. It must also be remembered that the air temperature was staying between 38 and 40 centigrade (100 to 104 F). The second group – Juris, Vilnis, Girts and Dimitrijs, arrived with the transceivers and other odds and ends. Using joint effort, we repaired the old GAP Voyager that had been left from a previous occasion, and put up a Mosley TA-33-M with a rotor. 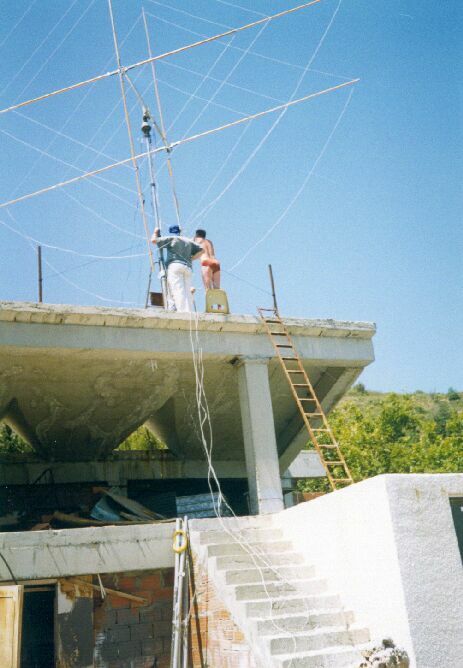 The problem was situating the antennas, since there was room only on the roof and down-slope from the hotel. Be it as it may, and mostly due to Valery’s childhood-learned stone-throwing skills, the sloper lower ends were located a good distance away. There was a chronic shortage of Kapron line; the local stores were sold out. The rest of brought supplies were sufficient; there was enough cable and other “stuff”. The only unnecessary item was a riveting pliers, which Jevgenii didn’t want to leave behind when boarding the plane. Actually, the number of people needed for contest operations is low, but when considering the need to put up antennas swiftly, and the lugging of the weight to and from the airport, the number of people in the group must be larger. The operation was set up in a rather small hotel room, on some tables, the PA on the balcony. The primary transceiver was to be Girt’s IC-775DSP. Before the contest, he proudly unpacked it and claimed that this “box” hears everything. But reality kicked in, and high hopes turned to anxiety and the opening of the transceiver cover. The IC-775DSP 9 MHz filter got shaken out of the base, but luckily it was a commonly known problem and soon found and fixed. It was more difficult with the other IC-756 transceiver. It was completely “dead.” It turned out to be the same mechanical problem – one of the big power supply transistors got shaken out of its mounting. Luckily that was all, since serious repairing was out of the question here. However, it was commonly agreed, that there was a need for additional repair items to be carried in the future. Here we were fortunately lucky, this time around. Amplifier ACOM-2000A, oho, that was “the ticket”. Put it out in the balcony and forget it: remote operation. No need to give it beer. Just keep feeding it with good Cypriot electricity. Here it is 240 V and 50hz. Two types of wall receptacles: 5A with three round connections, and 13A with three square connections – UK style. Suprisingly, there was no noticeable voltage fluctuation, considering where we were. The ACOM-2000A linear amp shifts bands automatically; the coax does not have to be moved. Only the antenna coax must be correctly attached by band. We also had an IC-1PW amp, but it would not switch bands automatically. We used a remote control switch with commands transmitted via coax. We had a minimum of coax in the room. We also had automatic CW keyers, but they were not used. Everyone relied on his speedy two fingers, and automatic CW keying by computer LPT port. The unusual part was SSB activation by VOX. We forgot the footpedals at home. This caused some habit-induced additional phrases on the air. Some unfortunate UA9xxx operator had a particularly difficult time. He probably didn’t hear us too well. A few words about operators. Not all of the team members were “superoperators” and big contesters. However, the sum total of the team proves otherwise. Under normal circumstances, it takes only a few good operators to run a 24-hour operation. Each has his own task tailored to his abilities and desires; each is responsible for part of the operation. It must be emphasized that additional workload piled up on an individual costs dearly in results. Main operators are Girts, YL2KL, Igor, RZ3BW , and Valery, YL3CW. The job of overall operational coordination fell on Juris,YL2GM . At the alternate operating position mingled mostly the other members of the team, with the main load being carried by Dimitri, RA9CO. However, there was very little heard at the alternate position. Valery worked SSB at such speed, that in-between transmissions there was very little heard anyway. And with Girts on CW it was even worse; nothing could be heard by another person. The antennas are too close to each other, and the receiver is completely swamped. It appears we had too few 160-meter contacts, but we just didn’t hear any more. Also 40 meters remained quite unworked. 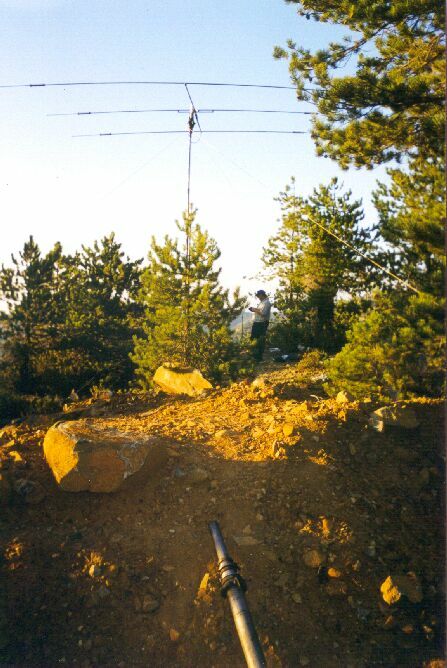 10 meters are lively, with a funny-sounding H2Q signal coming from the other side of the mountain. P3A comes booming in on all bands. They are located here on the northern coast. We hear beautifully our friend Oleg, YL3DW, who should have been here with us. It is interesting to hear the voice of Roman, UP5P, who is better known to many as an RTTY leading operator. So on and on are heard familiar and less-heard calls. We intensively used packet cluster on 2 meters. Primarily Igor, RA3CQ, worked it. However, we were not connected to the CT net, because we lacked a COM port on the laptop. The laptop keyboard sometimes felt very small, but we had no other equipment. We tried to rent a local PC, but the rental price was nearly as much as the cost of a new PC. Time flies fast, some get to enjoy the beautiful mountain sunrise. Now we are just waiting for the final results. We feel that the work paid off. Finally, the contest has ended, but there is still a big job looming ahead! Everything must be disassembled and transported away; and there is little time left. Some already have to board a plane for Moscow Monday evening, others Wednesday evening. Part of the equipment will be left here in Cyprus; part goes back home. Monday afternoon all is collected and packed. Jevgeny skins his head a second time. Things improve; Dimitri rents another car, so now we all can get to Limassol in one trip. Only upon arrival in Limassol did we get a feeling for what happened and what was accomplished. In the mountains we had no time for fun, now is catch-up time. First a good dinner in one of the local restaurants, then on the road again, heading in a western direction from Limassol. As it turns out, we arrive at a rather nice beach, a small bar nearby, and warm Mediterranean water and big waves. “KEO” beer tastes good, and everyone starts feeling better. Igor says that nearby is located the old Kurion amphitheater. The impression there becomes almost like the impression gotten from the ACOM-2000A. Imagine walking on a colorful mosaic floor made of little bits of stone arranged in fantastically beautiful patterns, or walking down steps to the center of the amphitheater. Your voice there sounds as if coming via a Heil microphone, and the sign at the entrance suddenly hits you: 2nd millenium before our era. Not all here is that old, some things here are of a more recent age. The old town grew over hundreds of years, and the space is so large, that one can drive around in a car. We know too little about the local history and culture. Maybe this place of ancient wonders answers some of the many questions we have. Igor “aggressively” is steering the car, between wine and tangerine fields, in the direction of Limassol, probably feeling more fortified by the “KEO” tasty brew. It seems that he has finally found the knack to keep the car on the left side of the road, and he is demonstrating the more recent and beloved passing maneuvers of Muscovite car enthusiasts. Some local drivers sympathetically watch. Young studs, sitting on powerful “choppers,” smile. It is evening in town, the heat of the day has diminished, and all, locals and newcomers alike, are out on the street. On both sides of the main street one can find anything; you want souvenirs - please; you want beer – please; you want – “thank you, nothing,” also – please, only don’t touch anything. Yes, we even met Cypriot pussycats, but they are more impressive on T-shirts. The last “heroic” deed happens in the evening, well, almost late at night – we roam the streets of Limassol. A disco bar bouncer, big shoulders and all muscle, daring you to approach him, recognizes Girts. No problem, the man is a soccer fan, and in Riga now is “Skonto.” He remembers that it is somewhere in Latvia. We run into an old acquaintance, a taxi driver. He promises to help us out with a small van for a trip to the airport. Soon is departure time. Our reported score is 4515 QSO’s and 5,530,716 points. H20A rezults, More, hopefully, to follow; IARU championships will continue, won’t they?